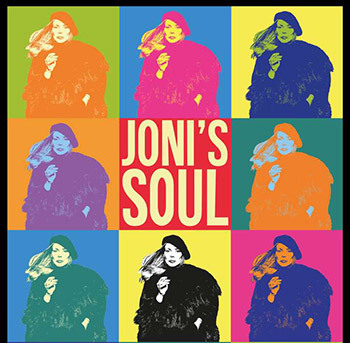 Joni's Soul began as a collaboration between expressive "from-the-heart" singer Gina Foster and former Van Morrison guitarist Ronnie Johnson, enlisting some of UK's very finest players with a shared love for an artist they consider to be one of the greatest singer/songwriters and guitar innovators of the last half century. Drawing on their own emotional response to these songs Joni’s Soul have looked beyond merely the faithful reproduction of the Joni Mitchell songbook to shine a light on the most soulful aspects of her words and music. The band's recently released cd 'Shades Of Joni' passionately illustrates their well-defined and warm interpretations of some of the finest songwriting and performance of the twentieth century. Joni's Soul is Gina Foster (vocals), Ronnie Johnson and Patrick Johnson (guitars), Ross Stanley (keyboards), Steve Pearce (bass), Richard Bailey (drums). More information here.